Thursday night: Passing shower, otherwise cloudy. 40s Thursday: Early shower possible, then peeks of sun. Milder. Upper 60s. Friday: Warm! Midday shower possible. P. sunny. Upper 60s to low 70s. It was a frigid start to the day with most locations starting off in the 20s to low 30s under mostly clear skies, then, the clouds moved in, keeping those afternoon temperatures cool and much more seasonable for this time of the year. What a way to start off the month of November, after one of the warmest October’s on record for most of New England. Boston finished in second place for warmest October with an average temperature of 61.4, with 1947 still holding that top spot by a tenth of a degree. Among the number of cities across the region that took the top spot for warmest Octobers, Worcester, Massachusetts, Manchester, New Hampshire, Burlington, Vermont, Portland, Maine, Bangor, Maine, and Hartford, Connecticut. Now back to the forecast. Showers likely move in this evening into northwestern New England and continue to fill in across Vt., N.H., and Maine overnight and into tomorrow morning. A few spotty showers are expected into southern New England tonight as well, but not as widespread. Expect overnight lows to not be nearly as cold as last night, which is welcome relief for those who are still without power or heat across New England from Sunday and Monday’s storm. Overnight lows slip into the 40s for most and a few upper 30s along the Canadian border. 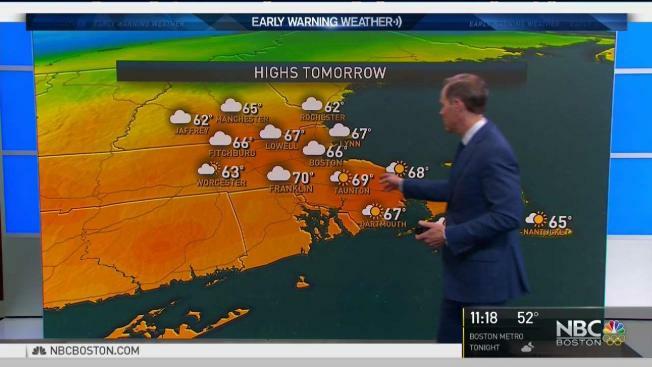 Thursday brings another mostly cloudy day with some scattered showers, but slightly warmer as highs swell into the 60s as a warm front glides across New England. Friday brings the warmest day this week with highs into the upper 60s with a spot shower as a cold front takes it’s time sliding in from the northwest. The cooler air sinks in for the weekend with highs around normal for this time of the year. Plus, don’t forget to change the clocks back one-hour this weekend as Daylight Saving Time ends early Sunday morning. The extended forecast brings an unsettled weather pattern to start off the week, before a cool down races in late week. We’re keeping an eye on midweek as a system could evolve bringing rain for most and mountain snow showers north. As always, stay tuned for the latest updates.